Tea is good for you. Period. Research indicates that drinking tea may lower your risk of heart attack and stroke because it contains antioxidants, among other things. Ever wonder where your tea actually comes from? What if we told you most of the tea produced around the world comes from two varieties of Camellia sinensis? In our "Camellia Plant and Your Tasty Cup of Tea" we'll teach you which varieties produce your tea and which specific types of tea are made this way. This episode is meant for any level of gardener who wants to learn more about what the Camellia and its incredible uses. Also, if you want to learn more about Camellia plant care in general, including its characteristics, colors, maintenance, and history, read our Camellia: A Gardener's Guide and Plant Profile. One specific species of Camellia is the main source for (most of) the tea you drink. The species Camellia sinensis, specifically the varieties sinensis and assamica are the main source for Camellia leaf tea around the world. Wild Earl Grey Black Tea, packed loose. Many generations of selective breeding have occurred to make the perfect tea leaves and the work continues. To make each one of these teas, the leaves are processed differently to get that specific flavor or, as the tea experts say, oxidation. To learn more about how tea leaves from the Camellia sinensis are used to process tea, read this article from the American Camellia Society. The Camellia is a widely used and indispensable foundation plant in landscapes around the world for mostly shaded areas and for winter flower interest. The species Camellia sinensis, specifically the varieties sinensis and assamica are the main source for Camellia tea around the world. Print Your FREE Camellia Plant Profile! Subscribe to our Spoken Garden community and receive your FREE Camellia Plant Profile! Included in the plant profile: Camellia general plant info, maintenance tips, companion plants, and a planning guide! 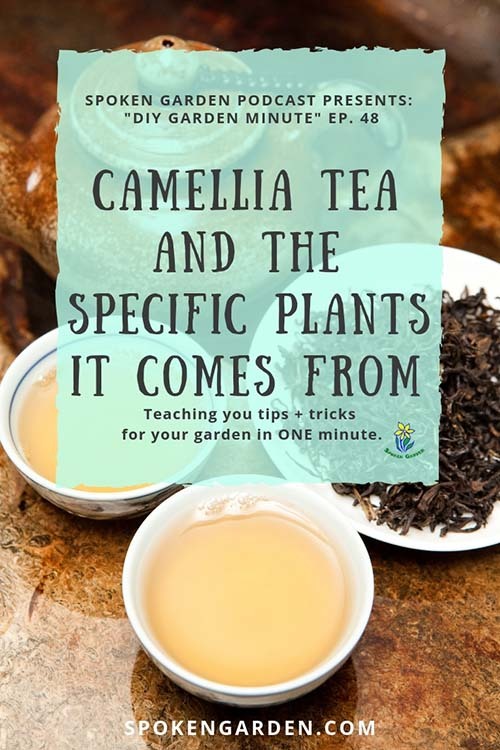 Click the graphic above to save "Camellia Tea Plant and Your Tasty Cup of Tea" to Pinterest for later! Learn how Camellia sinensis is used for producing tea around the world. The Camellia sinensis species and its two varieties used to produce most of the tea around the world. The specific types of tea created from these two varieties of Camellia sinensis.